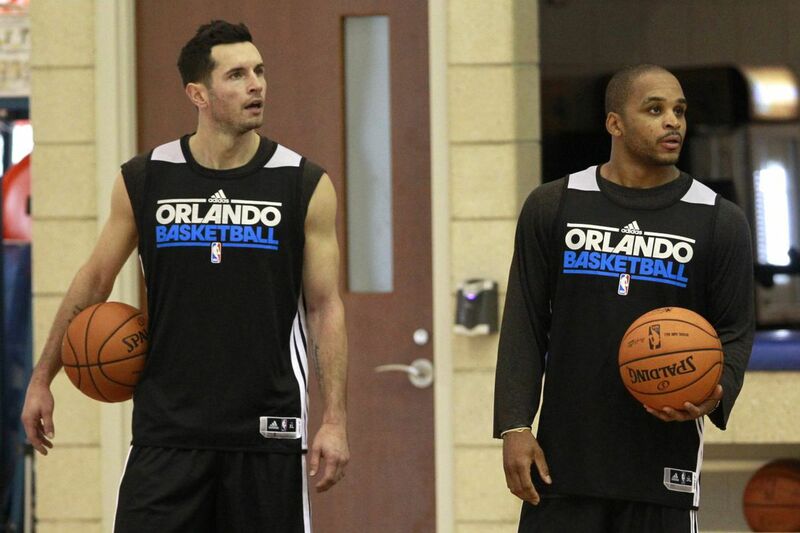 The Orlando Magic’s J.J. Redick (left) and Jameer Nelson listen to head coach Jacque Vaughn during training camp in October 2012. Teammates come and go for professional athletes. They remain largely strangers to one another, passing time together for intense, usually brief, periods. Away from the field or the court or the rink, they have their separate lives and differing goals. They are young and old, rich and relatively poor, from urban and rural areas, and the only common bond is the sport, and that rarely holds after the revolving door of the locker room swings round again. "There are only a few guys I've met through basketball that I would really call my friends," Jameer Nelson says. But Nelson, from poverty-riddled Chester, found one of his best friends in one of those teammates, even though the teammate, J.J. Redick, the new shooting guard for the 76ers, might as well have been from the other side of the world and the other end of the basketball experience. That's the difference between Nelson, an undersize point guard who went to nearby St. Joseph's University and had to make his name from there, and Redick, from Cave Spring High School in Roanoke, Va., an anointed star who came out of high school as the No. 2 shooting guard recruit in the nation and was chosen to play among college royalty at Duke University. Their paths met in 2006 with the Orlando Magic, which had just taken Redick with the 11th pick in the draft. Nelson, also a first-round pick (taken 20th by the Denver Nuggets in the 2004 draft and then traded to the Magic) was in his third NBA season. It would appear from the outside the two men didn't have much in common, no basis for forming a bond that might last, but that isn't the way it turned out. J.J. Redick, a guard from Duke, spoke to reporters after he was chosen by the Orlando Magic as the 11th overall pick of the 2006 NBA draft at Madison Square Garden in New York. "They grew up in two different areas, but they're very similar people," says Stan Van Gundy, who coached Nelson and Redick for five of the seven years they were together in Orlando. "They're both about winning. That's what their ego is wrapped up in, not in the numbers they put up or anything else. In terms of character and their values, how they look at things, they are very similar people." Redick says their friendship needed to develop over time, and he's got a pretty good idea why that was. "I don't think a lot of guys on that first Orlando team I had as a rookie liked me all that much. I was a little arrogant, like a lot of rookies are. You're a little naïve to things," Redick says. "But Jameer, out of all the older guys and established guys on the team, was really good to me in terms of encouraging me, teaching me and trying to keep me positive early in my career when I wasn't playing. "It was probably by the third or fourth year we were together that we really started to develop a bond, and by my seventh year there he and I had become very close, our families were very close, and we still are. But I don't know that anyone could have liked me right away. Sometimes in life, you need to be humbled a little bit." The NBA accomplished that for Redick, who didn't start a game until his third year in the league (and only five that year) and didn't earn enough playing time to average double-digit points until his fifth season. He could always shoot the ball. That had been his calling card since he was a teenager, but that alone couldn't keep him on an NBA court. "When he wasn't playing, he still worked his tail off," Nelson says. "He struggled with defense, but he got better. You don't go from being the best player in a college situation for a year or two and then be the same in the pros. He and I both saw that firsthand. But both of us learned to stay ready, and when the coach was ready we were set to go. The reality is it was our deficiencies that were holding us back. My situation was before his, so I was able to tell him the truth." Nelson's career arrival was a little quicker. He was the everyday starter by his third season, Redick's rookie year, averaging 30 minutes per game and earning a reputation as one of the best team leaders in the league. Of course, that didn't mean Redick would be willing to listen to his advice. The Orlando Magic’s J.J. Redick (left) and Jameer Nelson defending Paul George of the Pacers in March 2012. "It's not always easy to talk to peers and tell them what they need to do," Nelson says. "But he wanted to learn, wanted to get better. It's a competition and it's not for everyone. You don't always find guys like that." "Something both of them have in common is honesty," Van Gundy says. "Neither one is afraid of honesty. They were easy to coach because they liked to be told the truth, and they weren't afraid to tell you the truth, either to a coach or another teammate. You never had to wonder what's going on with this guy or anything else." As the seasons passed and the Magic built toward an appearance in the 2009 NBA Finals, the honest talks between Redick and Nelson expanded far beyond basketball. If you can trust a guy to see things the same way on the court, you learn to trust that he will listen to you and consider your thoughts on anything. "We realized that we shared a lot of the same values," Redick says. "As much as I enjoyed playing with Jameer and being his teammate, the real enjoyment for me was Jameer as a friend, watching Jameer as a husband, and a father, and a man of God. Those are the things we bonded over. We had a lot of success in Orlando, but that off-the-court stuff is where we really found common ground." That friendship grew from the way Nelson always tries to form a group of disparate players into a real team. Every summer, not just in Orlando, but in some of his other stops, Nelson would organize what was jokingly called Camp Jameer, a weeklong team-building exercise in the Philadelphia area that he paid for entirely out of his own pocket. He would put his teammates up in the Conshohocken Marriott and every morning cars or a van would take them to a pickup game at a local gym. Nelson brought in other players who happened to be in the area for the games, but the Magic players were at the core of it. Then, in the afternoon or evening, there was another team-building activity that had nothing to do with basketball. All week, the players rode together, ate together, joked together, got to know each other better. It was what the point guard thought would work. "Unbelievable," Van Gundy says. "I've been in this league around 20 years and I've been fortunate to deal with high-character people. It's a good list, but Jameer is the single-best teammate I've observed in my 20 years. He's always attuned to what's going on with all his teammates on a daily basis." "I don't want to take all the credit for it," Nelson says, "but when we did those bonding camps, we always got off to extremely fast starts in the season. It was all about getting together, seeing each other and feeling like it was in-season for a week. Who's better to have fun with than the guys you go into battle with?" It was fun and games, but it's never just fun and games with professional athletes. It didn't matter if they were sweating through the pickup games or throwing themselves into the afternoon sessions, it was serious. "My favorite one was a paintball competition," Redick says. "We drove about an hour outside the city and divided up into teams and we went at it. That was a blast. Another time we went to the Phillies and took batting practice with the team. And the whole week, you're riding together to workouts or just spending time, and you're sort of out of your element, so you open up. I'd also mention that I had, by far, the best swing on the team. Ryan Howard told me that I looked like the only person on the entire team that had actually played baseball." All those things added up, and particularly between Redick and Nelson. By the time their careers went in different directions — with Redick being traded by Orlando to Milwaukee at the trade deadline on Feb. 21, 2013 — it had added up to a lot. "It was always bigger than basketball for J.J. and me," Nelson says. "We talked religion, family. We talked about everything. We still talk all the time. We get together with our wives on occasion. He's straight up and down. With J.J., there's no sugarcoating. If he likes you, you know it." "I'm from Appalachia. He's not. Jameer and I have actually joked about that before," Redick says. "Where on the surface you say, 'Well, those guys probably don't have a ton in common,' ultimately we did, and we still do. We talk for an hour and maybe 30 minutes is what every NBA player does, venting about the season or getting information about certain guys, and then the other 30 minutes is always talking about our kids and life stuff." Life has brought Redick, 33, to the 76ers, where he signed a one-year free-agent contract to add the outside shooting touch the team has desperately needed for a long time. Nelson, 35, is about to begin his fourth season (third full season) with Denver. Each man is on his fourth NBA stop. The Sixers, who need some veteran leadership in the locker room, could have probably tried to acquire either guy in the offseason. "He's just what the Sixers need. They needed a couple of guys to show the ropes to players who don't understand yet what it takes to be a professional," Nelson says. "You have to have a work ethic and you have to be able to handle adversity. He's an all-around pro." Everything came easily for Redick through high school and college, but the pro game required something else that had to be developed inside him. "If you want to go by all the measurements and testing, there's no way he should have had the success he's had," Van Gundy says. "He's small for his position. He's short-armed. He's an average athlete. It's just his work ethic that has made his skill level so good, and he's got phenomenal ability to concentrate and be disciplined and not make mistakes. That's a talent that is too often overlooked. I haven't seen anybody better at it than J.J."
At least a part of what the Sixers will get from J.J. Redick this season can be credited to Jameer Nelson and the direction he offered as a teammate while their friendship grew. Redick had his own drive, and his own commitment to the game, but Nelson offered to be a match for that dedication. They became two players who were ultimately the same despite their obvious differences. "The second week of my oldest son's life, Jameer had just signed in Dallas, and on a random Sunday afternoon, he and Imani drove down, like a 3 ½-hour drive to see him," Redick said. "They stayed for just a couple of hours. We didn't have food, drink, nothing. We just sat and talked, then they drove back. And I said to myself, 'He just spent seven hours in a car just to meet Knox. I've had a lot of great teammates and made a lot of great friends in the NBA, but there's only a handful of guys like that." Nelson, of course, says the same thing. Teammates come and go, but finding your mirror image doesn't usually happen, and for them, it never mattered that their images in the locker room mirror were far more different than alike.